It is very nicely made and very comfortable. The ties are rather long, (which I wasn't use to) but they are not a problem. There is a definite learning curve to getting her on my back. The first few times Chowder spotted me. Now I still kneel on my bed while I'm strapping her on. I have been able to get so much done with her on my back. She is such a perfect baby and never cries, but I hate to leave her laying on her back under her playgym or in her seat for a hour at a time eventhough she doesn't complain. Chowder is looking forward to getting to use it, too. That is the other nice thing about it. So, hats off to Niki again! Interesting... 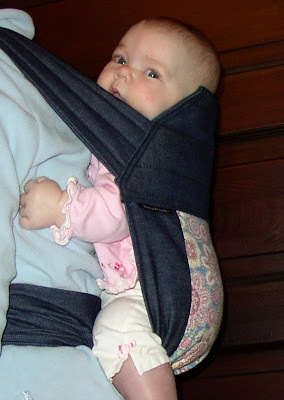 I think the fabric looks nice and softer than regular babycarriers? Mine was ok, but the fabric was really course and i didn't like it rubbing against the baby's skin. Shaz~The fabric is great. Very soft and smooth. Hey there - So glad you got a mei tei. 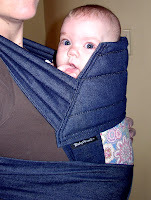 As you know, I always loved mine (Kozy Carrier). I actually used it with Nicholas starting at birth. I never actually tried the back carry though, but may soon. Don't really put him in carriers much anymore, but your blog has reminded me I need to give the back carry a try. Love, love, love mei teis! OOh, I like that. Remind me to buy one if I get pregnant again. OK? She is looking good! Thanks for posting pictures! I LOVE seeing babies being worn! :) Thanks K!